We celebrated Chinese New Year by making a stir fry dinner with local vegetables, chicken and an amazing spicy peanut sauce. I’m not sure this is a dish anyone from China would actually recognize, but it was fresh, tasted good and gave us all a moment to reflect on the beginning of the Year of the Snake. Stir fry is one of those great, eternal cooking techniques that can make a delicious meal from an endless combination of foods. And right now, we have a seemingly endless supply of Chinese cabbage in our garden, so this recipe was just the ticket to make a dent in it! If you haven’t grown Chinese cabbage, consider it this spring. It is very tasty–fresh and crunchy, but also a little sweet. None of the cabbage “bite” that European cabbages have. The sauce we used is an adaptation of THIS salad dressing posted by Creative Noshing. It is really pretty amazing–spicy and a little sweet. We loved the dressing so much that we modified it as a sauce for stir fry. YUM. This recipe is my technique for making stir fry. I like to cook small groups of ingredients together and then add them all in at the end. I find that this way, I don’t have overcooked vegetables and my wok stays fairly hot. You can add the sauce at the end of cooking (we’ve tried this), but it is much better to give each guest some sauce to add at the table instead. You can season your stir fry as you go–I love the taste of the vegetables so much that I don’t generally add salt and pepper except to season the chicken. Put all ingredients in a food processor or the mixing container for an immersion blender and blend away until smooth. Set aside. In a wok or very large saute pan, heat the coconut oil over high heat. Sprinkle chicken with salt and pepper. When oil is hot, add chicken to the wok. Cook chicken quickly, tossing in the wok to keep the chicken from burning. Cook about 4 minutes or until chicken is browned on all sides. Allow remaining oil to heat again. When hot, add the onions, peppers, and carrots. Toss and cook on high for about 2 minutes. Remove to bowl with chicken. Add more coconut oil if needed and heat wok over high again. Add the mushrooms and broccoli. Toss for 2 minutes. Remove to the bowl. Add the greens to the wok and stir fry over high heat for 2 minutes. Add all remaining ingredients back to the wok and toss well. Check for seasoning and add salt and pepper as necessary. Plate the rice and add the vegetables and chicken on top. 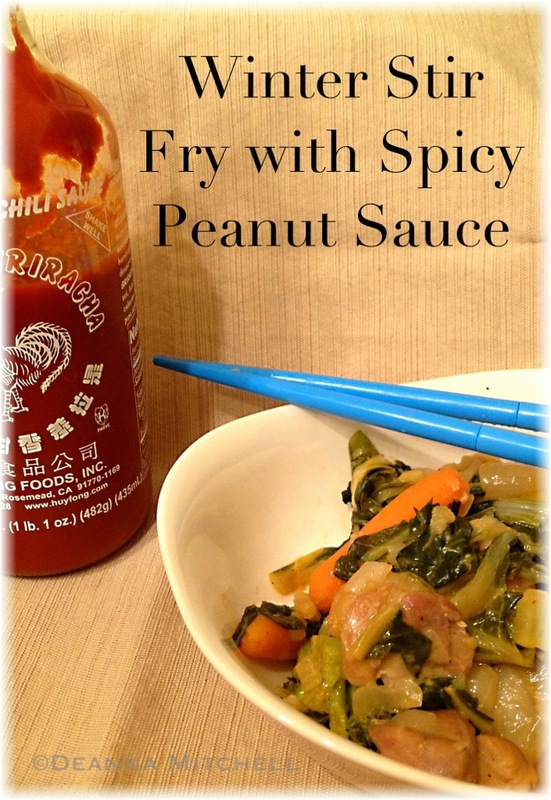 Serve with spicy peanut sauce. Playing catch up!! I’ve been eyeballing your posts all week but don’t like to speed read things and then leave some kind of halfway comprehensive comment. Ha. Anyway— Creative Noshing always has THE BEST salad dressings, right? I wish she updated more. Stir fry is one of those meals my kids really love and it uses up all the random veggies I have in the crisper drawer. Sriracha is one of my absolute favorites!! !